When we talk about epoxy applications, we often mention large-scale infrastructures in shipbuilding, aerospace, automotive, construction or energy plants. But we have said it before: even if used in small quantities, epoxies can go a long, long way. 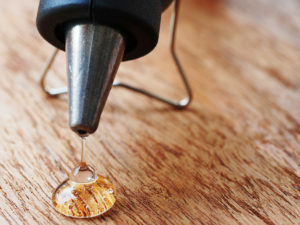 This is especially true for epoxy-based adhesives in which a very small amount can efficiently glue materials as different as wood, metal, plastic, rubber, glass, ceramic or stone. If it wasn’t for adhesives, how could we even start building those large infrastructures? Epoxy adhesives can come in two different ‘flavours’ with the same efficiency: they are available in the form of powders or granules and in the form of liquids or pastes. The first ones are one-component hot cured adhesives, whereas the second ones are two-component systems cured at room temperature. One component epoxy adhesives provide an excellent adhesion to metals, and an outstanding resistance to weather and harsh chemicals making them a great alternative to welding and rivets. Two component epoxy adhesives are found in all market segments. The time the adhesive can be processed and bonded after mixing can vary from a few minutes to several hours. Their major advantage is that they are suitable for bonding nearly all substrates, and they have high long-term stability because they don’t usually creep, meaning that they do not deform under the influence of mechanical stresses. In two words: they are very versatile and stable. The large variety of epoxy resins and hardeners allows us to select the best product depending on the material(s) to bond and also the working conditions. In construction, epoxy adhesives are commonly used to bond steel, to reinforce plates or carbon laminates and to strengthen beams and columns. They are also used for bonding segments in bridges and viaducts, where they may completely substitute metal screws or bolts, providing an effective resistance to the constant load on the road and the different temperature ranges. In shipbuilding, epoxy adhesives can strongly bond thin materials while avoiding thermal deformations and stresses, thus increasing the loading space. In automotive, epoxy adhesives are often used together with another joining technique. The epoxy glue together with point welding of car bodies ensures a desirable distribution of the weight, thus maintaining a high resistance to ageing and corrosion. In aircraft, epoxy adhesives are used to put together different elements. This is possible thanks to the great mechanical properties, such as resistance to creep under sustained load and temperature, pressure or moisture variations. In electronics, the semiconductor industry uses epoxy adhesives in manufacturing the printed or integrated circuit boards due to their thermal conductivity, electrical insulation and high durability in extreme temperatures, which allows manufacturing faster and smaller microprocessors and data storage devices. Epoxy adhesives have a great future ahead. There is an increased demand for electronics, which also need to last longer, and epoxy adhesives can prolong their life-span thanks to a better insulation and protection of the circuit boards. These improvements, in turn, also result in environmental and economic gains. Likewise, the urgent need to lower fuel emissions is directly connected to how much vehicles weigh. Epoxy adhesives can have a big impact in this area by helping reduce total vehicle weight. The aerospace industry, and in particular drone manufacturing, is also growing and so is the need for more durable composites in construction. Taking all these factors into account, it seems like epoxy adhesives will have a crucial role in making applications be more sustainable, affordable and long-lasting.